As it turns out, nobody does. Well, maybe Ivar. But none of them really wants to challenge Ragnar. Ubbe steps forward, sword in hand, but he’s all but dragging it on the ground, and even when Ragnar cuffs him (twice!) he just stares at his father – and staring eyeball to eyeball at Ragnar would be terrifying – until dad grabs him and hugs him. Nobody poses the questions I’m asking, “Where the heck have you been and what have you been doing to yourself?” Because Ragnar looks terrible: old, sick, maybe a little mad (okay, he’s always been a little mad). And as the Outsider of the title of this episode, he is uncomfortable among his family – and we are uncomfortable with him. So, about that family, the sons of Ragnar and Aslaug (Alyssa Sutherland). If anyone is having trouble putting names to the faces of this Viking quartet, here is a family photo taken with dad and half-brother, Bjorn. 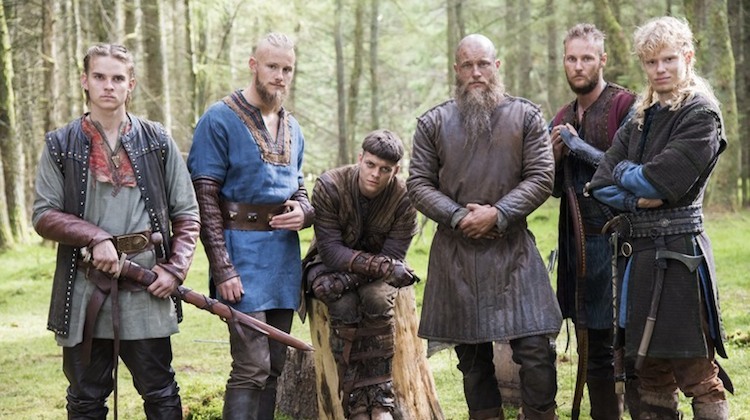 Left to Right: Hvitserk, Bjorn, Ivar, Ragnar, Ubbe, Sigurd. Got that? This episode allows us to become familiar with the younger Lothbrok boys and to see their relationships with each other. They are all capable fighters, they are all ambitious, and apparently they all like to sleep with the same blonde servant girl. But there are differences. Hvitserk (Marco Ilsø) is fired up by Bjorn’s ambition to find Rome and plans to tag along…..Ivar the Boneless (Alex Høgh Andersen) is your worst viking nightmare. Writer Michael Hirst describes him as pathologically cruel, and he should know because he wrote him that way. Ivar was born deformed, and although Ragnar intended the infant to die of exposure, Aslaug saved him. (If Ivar knows about this, Ragnar had better watch his back.) Ivar’s bond with his mum has always been creepy and she’s never disciplined him. Because of his deformity he is driven to prove he’s as good as or better than his brothers at everything. Hirst seems excited by Ivar, but I’m not sure how much of him I can stomach….. Ubbe (Jordan Patrick Smith) is the eldest and has, in Ragnar’s absence, assumed a protective, father-figure role. He even arranges an assignation for girl-shy Ivar with that blonde servant girl…..Sigurd Snake in the Eye (David Lindström), the youngest, looks to big brother Ubbe as a father-figure – not surprising, as he never really knew Ragnar, and the half-mad, bedraggled man who returns from exile doesn’t measure up to the myth. There. Enough with the sons. Back to Ragnar, who wants to go to Britain and wreak vengeance on King Ecbert for wiping out the Norse settlers eight years before. He asks each of his sons except Ivar to join him, and they each refuse because they have other plans. His next step is to approach Floki (Gustaf Skarsgård), but Floki has given his oath to Bjorn. There is an intriguing exchange, though, between Ragnar and Floki. “If you don’t come with me I’ll never see you again,” Ragnar says. When Floki insists they will meet in Valhalla, Ragnar replies that he doesn’t know if he will go to Valhalla. We’re reminded of the very first scene of this season, when Ragnar dreamed of Valhalla and of the golden door that shut him out. 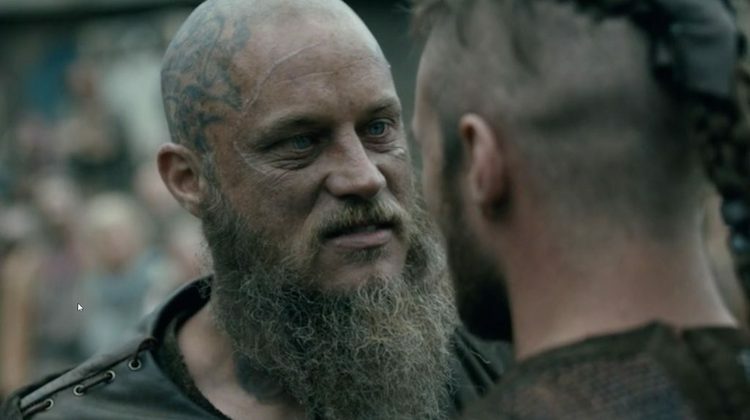 Ragnar is clearly coming to terms with his own mortality and beliefs, and in this scene he seems to be bidding Floki what he believes is a final farewell – the final chapter of a turbulent friendship. Next stop, Hedeby, where Lagertha (Katheryn Winnick) is living the good life with her girlfriend Astrid (Josefin Asplund). Lagertha, badly wounded 8 years before, has survived beautifully. She looks about 20 years younger than Ragnar. Maybe it’s the food. I’ll have what she’s having! Lagertha is so done with men now. They have beaten her and betrayed her, and there is no way she’s joining Ragnar for a cruise to Wessex. We don’t even see any men in her lovely hall with its delicately carved accents. Maybe she picked up some decorating tips while she was in Frankia. Later we find her sitting on a bed with Astrid and the two of them are gazing at their lovely reflections in – is that a mirror image? WAIT! STOP! Ragnar bids farewell to Lagertha – a bittersweet moment that leaves him mildly shattered. He attempts to hurry his own death, but Odin’s raven intervenes. Sorry Ragnar, you’re not done yet. He makes his way back to Kattegat – and to Ivar. At episode’s end we still don’t know anything about what’s been going on in Wessex (Alfred the Great!!!) or Frankia (Rollo!!! ), and we don’t know what Ragnar was doing for those 8 missing years. But we know he’s headed for Wessex, and we know that Ivar is going with him, and I’m thinking that Ecbert the Awesome had better watch out.